Why do “maladies of the soul” such as hysteria, anxiety disorders, or depression wax and wane over time? Through a study of the history of psychiatry, Mikkel Borch-Jacobsen provocatively argues that most mental illnesses are not, in fact, diseases but the product of varying expectations shared and negotiated by therapists and patients. With a series of fascinating historical vignettes, stretching from Freud's creation of false memories of sexual abuse in his early hysterical patients to today's promotion and marketing of depression by drug companies, Making Minds and Madness offers a powerful critique of all the theories, such as psychoanalysis and biomedical psychiatry, that claim to discover facts about the human psyche while, in reality, producing them. Borch-Jacobsen proposes such objectivizing approaches should be abandoned in favor of a constructionist and relativist psychology that recognizes the artifactual and interactive character of psychic productions instead of attempting to deny or control it. 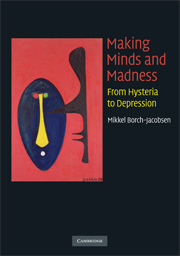 "In understanding the relationship between society and psychiatric illness, Mikkel Borch-Jacobsen plucks the baton from the faltering hands of the psychoanalysts and carries it into the 21st century. Here, from a historian of psychiatry, are some strikingly original suggestions for understanding traumatic neurosis, seduction theory, multiple personality, and much more of the ground first plowed by Charcot in Paris and Freud in Vienna. A dazzling intellectual effort." "It is a wonderful achievement scholarly but always accessibly written, provocative and utterly grounded in historical research or contemporary investigation as it asks how we make sense of the many 'maladies of the soul' that come and go over time. Its provocative but always thoughtful challenges to every aspect of the 'psy' professions - psychiatry, psychoanalysis and psychotherapy - deserve to be widely known." "This splendid volume should be on the book-shelf of everyone interested in the study of psychiatry and related subjects dealing with mental health...[ingenious book]..."